The last year or so I have been re-watching the whole Buffy The Vampire Slayer, Angel and Charmed series. I have them all on dvd. I was (and still am) a huge fan of all three of them. They came out around the time I was getting more active on the pagan path for quite some time. So they weren’t my first encounter with wicca and witchcraft, but they arrived at the right time for me. They complemented my interests at the time and furthermore I just love fantasy series. Above all, Buffy and Charmed are about girls/women that take matters into their own hands. No being dependent on men or just being sidekicks, no way: they are the heroes, they take control of their own lifes. The situations and people may not be real in a literal way but they stand for real life situations. Everyone has to face his own ‘demons’ and survive frightening ‘apocalypses’. A lot of the fantasy stuff in the series is a striking and powerful metaphor for something real. I know a lot of pagans weren’t happy with these series, because it led to a bunch of fluffy bunny’s (wannabe witches that have no clue what real witchcraft is all about) overflowing the pagan community. I can understand that, but I also disagree. There are more sides to it. Yes, of course there were fluffy bunny’s that wanted to learn how to freeze a room, levitate or throw energy balls etc. They were a bit annoying, but once they learned this isn’t how it works in real life they disappeared over time. However, there are also people that got interested in witchcraft through these series and wanted to learn how it does work outside the fantasy setting. The series were just an introduction into something new, which was more than worth it to explore further. 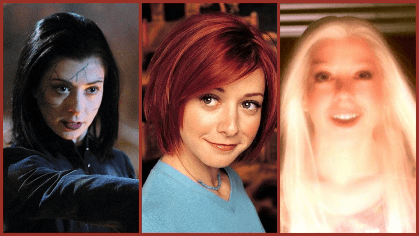 In Buffy The Vampire Slayer we follow Buffy as lead character, but in my opinion it was Willow that underwent the more significant character development. From a nerdy and shy little girl she grew into a strong woman that learned how to handle both her dark side and her incredible power. The ‘witchy’ things we see her do in the series are mostly pure fantasy, and the same goes for most other witches in the series. There are only a few references that are a bit closer to reality. The group at school that Willow visits is more about healing and nature, although later on they perform impossible spells too. Giles and Willow meet a powerful coven in England. We never really see them in the series, but they have hereditary knowledge and power. Their powers are again mostly fantasy ones though. The sisters have a Book Of Shadows that most witches could be jealous of, with beautiful crafted and calligraphic pages and powers of its own. I can assure you most real life BoS are a lot less glamorous, but also much more useful instead of just pretty! Prue often warns her younger sisters that ‘just because we’re witches, it doesn’t mean we’re above the laws of nature or the wiccan ones.’ Sometimes they are able to play tricks on those laws (travelling through time and those kind of things), but they try to follow the basic rules. It is often emphasized that magic has consequences, and rightly so! This is also visible in the fact, that the sisters can’t use magic for personal gain. Whether that’s possible and/or ethical in real witchcraft is a whole new discussion in its own right. If you keep in mind that Charmed is made as a supernatural drama series I think it has the right amount of realistic witchcraft things. Sure, still a lot is fake but if it were more realistic perhaps it would have been too much to handle for the general public at the time it was first aired. It was not made for pagan viewers only but had to appeal to a wider audience, so more commonly understood symbolism was used that can also be found in other religions. All in all I really believe that Charmed has done more good than harm to the general point of view about witches. It successfully opens the audience to a positive impression of witchcraft and wicca. Due to the revival of supernatural vampires and witches series these last few years there have been rumours about remakes of Charmed and even of Buffy & Angel. I sincerely hope Joss Whedon & Co are more creative than that… A complete remake is just too easy, both unnecessary and undesirable. They can’t get any better, no need to try. No copy-paste but new people, new stories! Follow the example of the Star Trek concept: create prequels, sequels or a parallel series situated in the same universe.